An all new Nook has been released today by Barnes & Noble packing a 6" touch-enabled E-Ink display and an 80% faster page refresh with minimized flashing compared to other E-Ink readers. The new Nook has improved long-lasting battery life which lets you read for up to 2 months on a single charge. You won't find any 3G inside the new Nook unlike the first generation except for built-in WiFi. The new Nook comes with pre-installed 2GB of memory that is expandable via microSDHC up to 32GB. It's 35% lighter and 6% thinner and over an inch shorter than the first generation Nook. 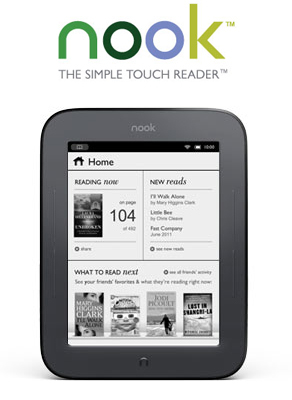 The new Nook is now up for pre-order for $139, and starts shipping on June 10.